We've Thrown Them About 100 Feet in our Warehouse. 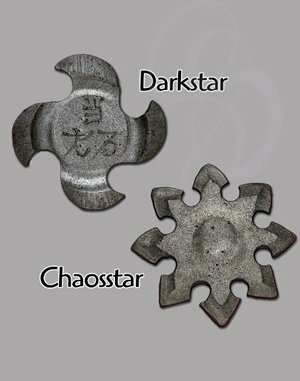 Dark Star LARP Throwing Shuriken - this product is being discontinued, terrific discount for the rest!! The stars are made from an extremely durable foam rubber that is really, really hard to mess up. In fact, I can't say that I've seen a single one of these stars with any sort of damage on them, and we've been beating the heck out of ours. 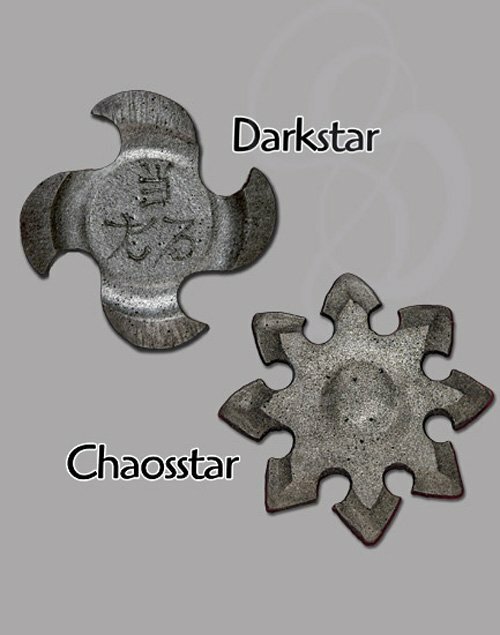 The shurikens come in two varieties, Chaosstar and Darkstar. The Chaosstar has lots of little points. The Darkstar has four big points. The Darkstar has Asian characters on it. Alright, I'm not really sure what the characters mean, so if anyone knows, please e-mail us at info@strongblade.com and let us know.